Considering the persistent increase in the rate of unemployment and underemployment over the last decade, it is safe to say that Africa needs innovative solutions to empowering its youths, and strengthening their drive for social entrepreneurship appears to be a sure bargain. It becomes even more important because in order to accelerate the pace of growth on the continent, social entrepreneurs are the answer being that they are able to develop themselves and their communities at the same time. Pertinently, as far as the 21st century is concerned, technology can provide a workable roadmap. 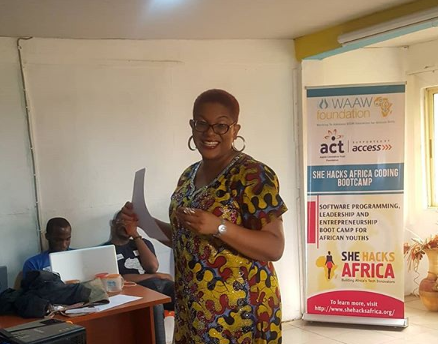 WAAW Foundation’s partnership with ACT Foundation has ensured that the She Hacks Africa initiative becomes a tool for developing and accelerating the growth of social entrepreneurs in Africa. Divided into cohorts, the rapidly expanding and impactful initiative is designed to build and equip aspiring social entrepreneurs whose passion it is to advance society by solving socio-economic problems. ACT Foundation CEO, Osayi Alile speaking on the need for a project that promises empowerment through digitization, maintained that it was important to find sustainable solutions to recurrent problems faced by society. “Africa has, and is still encountering a myriad of social problems particularly when the subjects of development and women empowerment arise. We have to encourage and propel new means to socioeconomic problem-solving. We see initiatives like this as a way to empower youths and propel them towards contributing to society and nation building”, Ms. Alile said. The graduation of She Hacks Africa’s Cohort 5 included a challenge designed with the goal of merging technology and entrepreneurship to find accessible, effective and stress-free solutions to lingering societal hurdles. The beneficiaries were grouped into six teams tasked with the responsibility of proffering digital solutions to real social problems by developing a social enterprise with a readily available internet presence. Through this challenge, the partnering organizations have reiterated their commitment to empowering the next generation of aspiring innovators and sociopreneurs.